With the China-US trade tensions showing no imminent signs of abating, markets will be looking to the Federal Reserve to see if this will have any bearing on their rate hike path. Admittedly, most of the recent escalation has occurred since the last Fed meeting, so the minutes are already in a sense outdated. And despite the posturing, most of the tariffs that have been threatened are yet to be implemented, which makes it an awkward topic for the central bank to comment on. Fed Chair Jerome Powell said on Friday that it’s “too early to tell” how the situation will play out economically. John Williams, who is set to take the helm at the New York Fed, has said the actions so far "don't add up to a huge effect." That’s not to say the Fed won’t be paying very close attention to what's been going on. With limited clarity on how far-reaching the implemented tariffs will ultimately be, we suspect policymakers will be looking carefully at the impact the announcements are having on confidence. It will be interesting to see if the Fed cites the opinions of business contacts on the impact they may be having on hiring and investment. The Fed will also be keeping an eye on the spill over to financial conditions, though so far, the impact has been relatively modest outside of the equity arena. Having said that, financial conditions are looking decidedly tighter since the start of the year, and a lot of this has to do with the London Interbank Offering Rate (Libor). Why is Libor important? Not only is it a central input to the pricing of financial markets products, but it also impacts about two-thirds of variable rate mortgages and a whole host of other things, including the likes of student loans. The most important driver of Libor is where the Fed pitches the funds rate, which is effectively an overnight rate. Most loan products, especially retail are not marked overnight but instead may have a monthly or quarterly reset. 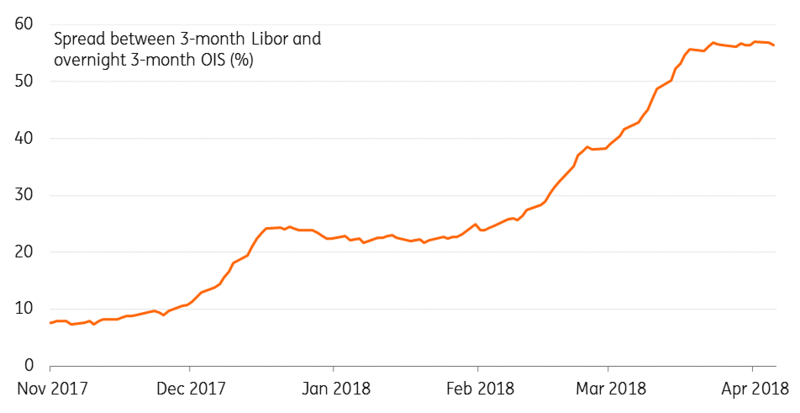 At the very front end of the curve, there is very little difference between the overnight rate and Libor, but there are deviations as we move a little longer on the curve. Take the 3-month rate, which is something of a US benchmark tenor. In recent years the spread between 3M Libor and 3M OIS been steady in the 0.15% area. However, it has shot higher and breached the 0.5% level in recent months. The implication of this is the effective rate used in many loan products is some 0.35% above what would have been if Libor had not spiked. This is the equivalent of at least an additional 25bp Fed funds hike. In a sense, the market has added an extra hike on top of what the Fed has delivered. Why has this happened? It essentially reflects gyrations on the commercial paper (CP) market, as a consequence of tax reform which is tempting US corporates to move cash back on onshore. As liquidations of offshore USD holdings are mooted, commercial paper rates have increased. This has impacted where banks can print CP, which has placed direct upward pressure on Libor fixings. This will abate in due course, but that could take some months. In the meantime, it effectively will act as an additional rate hike in disguise, and we may well see the Fed comment on this issue in this week’s minutes. After a year of disappointing inflation readings, in January's minutes, "almost all" Fed officials felt that it would continue to notch back to target in the medium term. This view should be bolstered by tomorrow's CPI data, which looks set to show core inflation back (or even above) the 2% target. This comes as a distortion related to cell phone data pricing drops out of the annual comparison. Throw in the weaker dollar, pressure from housing/medical costs and the fact that corporates have the pricing power to pass on higher costs and we suspect headline inflation will nudge closer to 3% as we head into the summer. For now, a healthy economy means the Fed is on track for four 2018 hikes. Trade tensions could still throw a curveball into the Fed's thinking on future rate hikes - particularly if President Trump were to resurrect the possibility of tariffs on European goods. We'll have to wait and see if calmer heads will prevail. But as James Knightley writes in his monthly update, assuming some back-room, facing saving deals can ultimately be agreed with major trade partners, the combination of strong growth and rising inflation means the Fed still looks set to follow through with three further rate hikes this year. Has the optimism around the outlook for the US economy been somewhat tempered by the risk of a trade war? One down, three more to come?